The Col du Galibier is one of the most famous passes in the French Alps. Due to its strategic position it was, until 2016, taken up 56 times in the course of the Tour de France. This makes this pass the clear leader in the Alps. 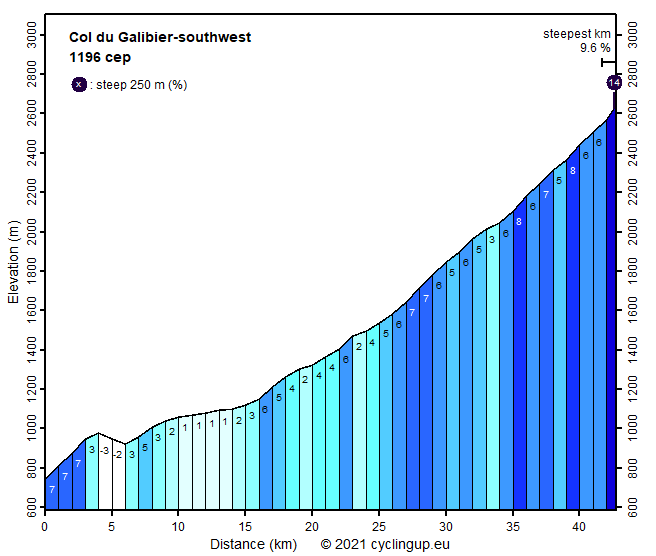 Another reason for the fame of the Galibier is its elevation. With 2652 meters it ranks as the number six of the passes in the Alps. The ascent from the south-west is very long (43 km) and all together hard (in 2016 it occupied the third place in the French Alps on this website). The last eight kilometers from the Col du Lautaret to the pass are identical to the final eight kilometers of the climb from Briançon. However, up to the Lautaret this climb is much more scenic than the approach from Briançon. Also, the road is more varied with more turns and more variation in the slope. The trip begins in Le Clapier and follows the D1091 towards Briançon. Up to the Lac du Chambon, which is reached after 8.5 kilometers, 300 elevation meters are gained despite a loss of 65 meters in a descent. An almost horizontal section along the north side of the lake follows, though in 2016 the route was temporarily relocated to an emergency road along the other side of the lake. About four kilometers after the end of the lake, the road begins to slope significantly again. The Lautaret is still 18 kilometers away with the slope varying between 2 and 7%. Unpleasant are some tunnels which are poorly lit for a busy road. So bring your own lights! Magnificent are the mountains south of the road past Villar d'Arêne. After the Lautaret the road gets more narrow and is moderately steep (6-7%) with little variation. Only the last kilometer from the entrance of the tunnel up to the pass is really steep (about 11%). After the Lautaret the mountains are rocky and, seen from the ascending cyclist, not really special. However, on the way back this section is of sublime beauty due to the view of the snow- and ice-covered peaks of the Écrins massif.